Can get Next day delivery! As much as I want that we live in a rented house, so can't put the hose through a wall, only an open windows which defeats the object. As much as I want that we live in a rented house, so can't put the hose … As much as I want that we live in a rented house, so can't put the hose through a wall, only an open windows which defeats the object. Try an Evaporative Cooler, even if you only hire one at first. We had two at work (Large floor) and they reduced the temp considerably, but not to an "Air conditioned" level where you felt the cold air being blow. I've just had to google for the name of them, and just seen that they best work near an open window to allow fresh air in, which then gets cooled down and blow into the room forcing warmer air out. Although we didn't have any windows open when we used it. We tried 2 of those ages ago and found they increased the humidity ten fold. Thanks anyway. Why is this cold anyway, 12000 btu is very good for the price. Nice idea that. What model aircon unit have you got? We tried 2 of those ages ago and found they increased the humidity ten … We tried 2 of those ages ago and found they increased the humidity ten fold. Thanks anyway. Why is this cold anyway, 12000 btu is very good for the price. How did that happen? As long as you discharge the pipe out of the window, any humidity should be sucked into the unit, turned to water and then discharged either out through the wall or held in the unit. Is this a good deal guys? 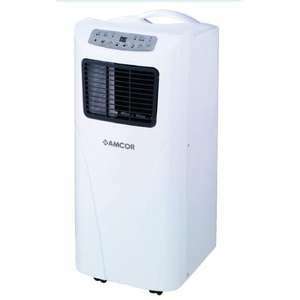 I dont know very much about air conditioners, or does anyone know of another decent air conditioners at a simlar price ? For the BTU's I would say yes, this is a good deal for a portable A/C unit. Ours has just gone bust, and I may well get this one. Are these any good... will they cool the room if i hang the pipe out of a window? Yes, this will cool a decent sized bedroom. They are loud, but the noise actually helps send me to sleep! BHS do the 10000 version for £169.. is this any good? How did that happen? As long as you discharge the pipe out of the window, … How did that happen? As long as you discharge the pipe out of the window, any humidity should be sucked into the unit, turned to water and then discharged either out through the wall or held in the unit. Evaporative Coolers don't have pipes. Actually, this model is this price at a lot of places. I have 2 air cons both amcor both 12000 btu. Ignore the manual when it says dont extend the hose/pipe as you can but @ a cost for every meter you extend it you lose 1500 btu. The people that make them think a hose/pipe @ 1.5 meters is just right for everyone well thats a load of poo. In my rented house i have a bay window and its the type that only have 2 opening windows that are @ the top i did have to put my first air con on a table but looked ugly and blocked the window view so i had to extend the hose/pipe. I have 2 air cons both amcor both 12000 btu. Ignore the manual when it … I have 2 air cons both amcor both 12000 btu. Ignore the manual when it says dont extend the hose/pipe as you can but @ a cost for every meter you extend it you lose 1500 btu. The people that make them think a hose/pipe @ 1.5 meters is just right for everyone well thats a load of poo. In my rented house i have a bay window and its the type that only have 2 opening windows that are @ the top i did have to put my first air con on a table but looked ugly and blocked the window view so i had to extend the hose/pipe. are they good?.. I need to cool my bedroom down. Will the 10000btu model be ok? Ignore the manual when it says dont extend the hose/pipe as you can but … Ignore the manual when it says dont extend the hose/pipe as you can but @ a cost for every meter you extend it you lose 1500 btu. That's interesting - is that 1500 btu/m lost when you extend, or is your 12000 reduced by using the supplied hose? That's interesting - is that 1500 btu/m lost when you extend, or is your … That's interesting - is that 1500 btu/m lost when you extend, or is your 12000 reduced by using the supplied hose? It is interesting I didnt know that extending the hose had the effect of reducing the cooling cabability. I have a 12000btu air con unit and I dont use the original hose supplied as it is waaay to short for top opening windows. I use 125mm diameter flexi type hose which is twice the length of the original hose and I drape that out of an open window. Then, I draw the curtains around the hose which leaves the aircon unit about half a metre from the wall. Warm air from the room is then pumped out via the hose through the window, and not much warm air from the outside comes back in, because the curtains are closed...job done! No I have a different unit but it is nonetheless a 12000btu portable aircon unit. You should be aware that they are waaaay too noisy to use whilst you sleep (unless you dont mind the noise). We put ours on a couple of hours before we go to bed, which means that the room is cool when we actually go to bed and therefore much easier to get to sleep. It works a treat for us and I wouldnt be without it.